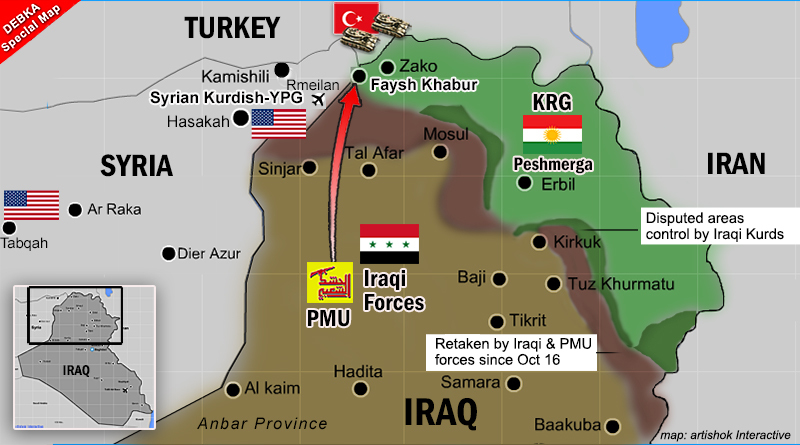 To cut off the overland corridor between Iraqi Kurdistan and the three Syrian enclaves ruled by the YPG militia. The Syrian militia is now barred from coming to the aid of its Iraqi brothers, the peshmerga. 2. To shut the only open door remaining to Kurdish residents wishing to travel outside Iraqi Kurdistan. The Iraqi government has cut all its air links by seizing the international airports of Irbil and Suliemeniyeh and threatening to shoot down any planes using them. The siege of semiautonomous Iraqi Kurdistan is therefore complete. Faysh Khabur was also the only land crossing the American army had the use of used for moving supplies to US forces stationed in northern Syria. The US army is now left only with air transit. Iran’s overland bridge to Syria via Iraq is now complete unimpeded by either the US or Israel. US and Israel hit the zero ground on their noise so hard. This is so obvious that US and Israel no more capable of dealing with Iran. Winner is Iran, loosers are US and Israel. The more territory the Iranians and their proxies occupy the harder will be for them to cope with an insurgency should one arise. The Islamic State has dispersed but can reappear, almost all sunni groups don’t like the shias and now they attacked the kurds also. IS seems very smart, just think how many russian intelligence officers they’ve killed and think that IS put a lot more effort in fighting shia iraqis than the syrian kurds for example. I would say to Israelis save yourselves , you are victims of these monsters !! Time for US and Israel to admit their defeat and move out of Syria/Iraq. GREATER ISRAEL GENOCIDE…….GREATER ISRAEL ATTACK ON NEW YORK ON 911…..when are Americans going to wake the fcuk up ?? Who let you out of your straight jacket? Bafel Talabani who is the oldest son of the Celal Talabani has to obey Iran otherwise Iran will publish Bafel’s dirty records. As trusted KRG official says; Iranian intelligence service was recording while Bafel Talabani was sexually abusing a 10 years old boy. Bafel’s Mom, Hero Ibrahim also witnessed the unfortunate event. The boy managed to escaped from Bafel Talabani after Hero Ibrahim’s shock following madness… However, Mom Hero Ibrahim chose to hide this secret until set-back of Peshmerga. Kurds must drop the Americans and go full alliance with the Russians. Its their only chance. U.S. will always stab Kurds in the back. Some of the Americans are allied with the Iranians. Sorry, but the Soviets (oops——I meant the Russians) are already allied with Turkey, Iran, Iraq and Syria, all of whom hate the Kurds! Things are all shaping up for the Northern Invader for Armageddon. The southern Confederacy will only ask questions, not stop the invasion. Sorry, but the turks don’t hate the kurds. We don’t like only terrorists. The overland Iranian overland bridge, from looking at the map, already existed, south of Faysh Khabur, passing through Sinjar. US troops in N. Syria now cut off from overland access to Kurdish enclave. Trump administration is currently up to it’s neck in significant domestic issues at this time. It was a well chosen time for the Iranian Solemeini to go for big gains. Democrat and NEVER TRUMP republicans have sabotaged American interests and freedom for the Kurds, by stagung their false flag Russiagate scandal. YHVH is setting His hooks, bringing Russia, Turkey and Iran into alignment for the fulfillment of His word. He will make His name great among the heathen. He will reveal Himself in all His glory! Therefore, thou son of man, prophesy against Gog, and say, Thus saith the Lord God; Behold, I am against thee, O Gog, the chief prince of Meshech and Tubal: And I will turn thee back, and leave but the sixth part of thee, and will cause thee to come up from the north parts, and will bring thee upon the mountains of Israel: And I will smite thy bow out of thy left hand, and will cause thine arrows to fall out of thy right hand. Thou shalt fall upon the mountains of Israel, thou, and all thy bands, and the people that is with thee: I will give thee unto the ravenous birds of every sort, and to the beasts of the field to be devoured. Thou shalt fall upon the open field: for I have spoken it, saith the Lord God. And I will send a fire on Magog, and among them that dwell carelessly in the isles: and they shall know that I am the Lord. So will I make my holy name known in the midst of my people Israel; and I will not let them pollute my holy name any more: and the heathen shall know that I am the Lord, the Holy One in Israel. He will reveal Himself in all His glory! And I will gather all the nations to Jerusalem to wage war; and the city shall be captured, and the houses shall be plundered, and the women shall be ravished, and half the city shall go forth into exile-and the rest of the people shall not be cut off from the city. Just a matter of time now. Russia and Iran are planning to take over the entire Middle East, First Syria and they have carefully planned Insurections in each Area, Conquer and divide then step in and take over. Russia is working on aligning Turkey and several other countries through Arms sales and loans. Putin which learned his trade in the KGB knows what ever you do very slowly, no one will notice, until it is too late. During the IRAQ war they lost billions in oil leases that were owed by Iraq. Iran wants to establish the Shi Empire over all of the middle East and get rid of Israel. Trump’s entire administration is either asleep at the wheel or complicit. When Trump and Putin met at WTO, he went outside Protocol and spoke to Putin for more than 30 minutes without a Witness of what was said is entirely against all Presidential security protocol’s either to witness what was or what was not discussed. In the fact he did this speaks clearly to the fact he had something to hide. Either Putin has dirt on Trump, or something. Ahayah Asher Ahayah is power that will bring all you nations down by the works of your own hands thus every man sword against his neighbor! OK: so now the Islamic Republic of Iran is competing with the Soviets (oops—-I meant the Russians) and Turkey over who will be first to take over the entire Middle East! Iraq, Syria, LIbya all for the Greater Israel Genocide Project……..the leaders of Israel not the people are fcuking nuts !!! ZIONIST EXTREMISTS ARE THE BIGGEST THREAT TO THE PLANET…….the world is coming for you MFS !! The Snake-Like Trump is supporting the Saudi peace initiative and has his own peace plan which will be suicidal to Israel. Trump sends his court Jews to appease Israel. But he will fail. The King and Creator of the world, HKB”H, is watching and guarding Israel. And He metes out measure for measure to anyone who goes against Him and the Land. Saddam was the enemy of Kurds and committed genocide against them. The Kurds didn’t assist or liked Saddam, however, most of the current political Iraqi Shia leaders with their families fled Iraq through Kurdistan, or they opted to stay and live in Kurdistan. Animosity and resentment against Kurds are the daily chores of the aforementioned Shia leaders. If they have the means, they will be worse than Saddam’s regime. From now on, the Kurds of Iraq should not trust anyone anymore. When and if the SHTF remember there are several million Kurds in Turkey and the Turkish PKK gave the Turkish Military their fair share of heartbreak and that was with just small guerrilla units. This went on for 20 plus years… until the Turkish Government and the PKK called for a cease fire, several years after APO was Captured. The PKK will gladly pickup arms and keep the Turks out of any fight except with them. They know the land and they know the Turks. Then you have the Iranian Kurds, millions… and they are KURDS and they will put a hurting on Iran, Iraq and Turkey if the SHTF. Kurds and are a POWERFUL force in SWA if those governments want to turn a blind eye towards them or discount them… they are POWERFUL, far more than people really know… they are the PRIDE of Saladin and Descendants of Alexander they are the peoples who have lived in those areas for thousands of years… THEY are not the, Oriental Turks, Middle-Eastern Arabs or Africans… they are KURDS.